Please contact me if you need more items than shown available. 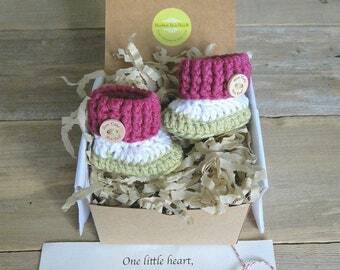 These adorable little booties, made for a newborn, come in a variety of colors and in their own little box. 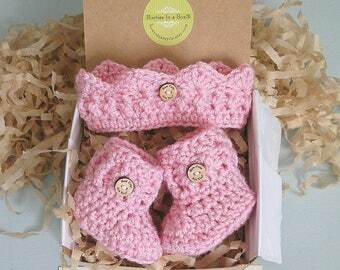 Ready to give as a shower or baby gift. 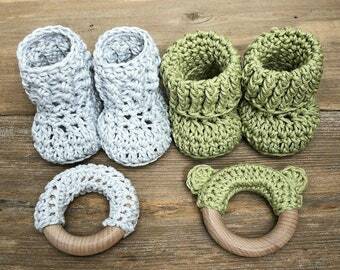 My shop is a crochet shop bringing you beautiful handmade baby items. My work has been featured in Pregnancy and Newborn Magazine. 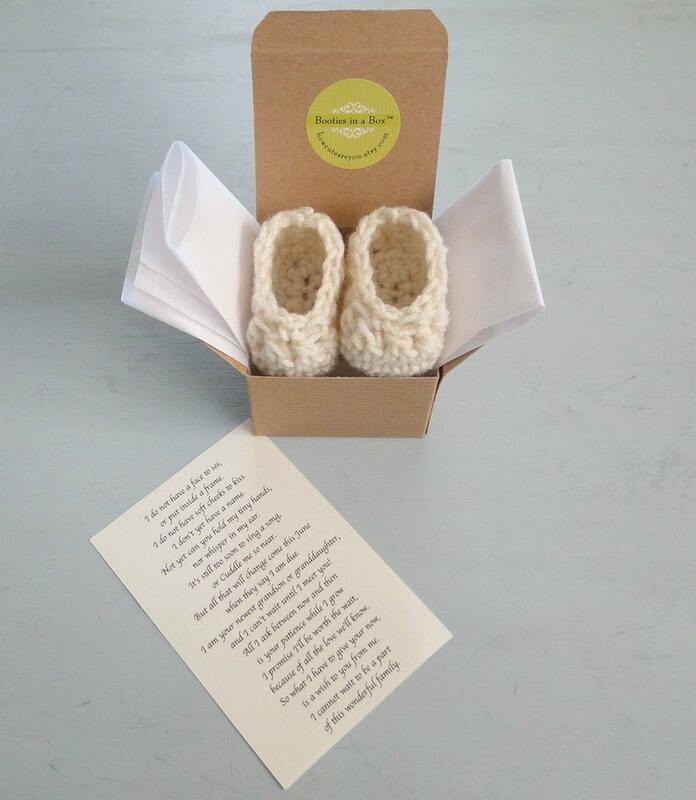 Booties in a Box® are a wonderful way to share the news with your family and friends. 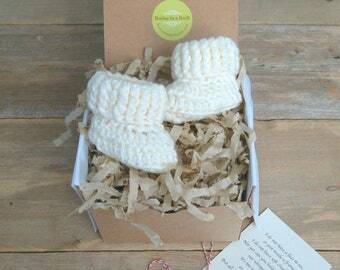 These adorable little hand crocheted booties can then be re-gifted when your baby is born. The lovely poem is sure to bring tears of joy to your family! PLEASE BE SURE TO CHECK SHIPPING SCHEDULE BEFORE PURCHASING. 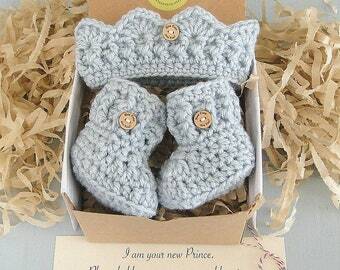 ❋If you would like for me to mail your booties directly to your recipients you will need to make a separate order for each recipient. Booties are shipped in a larger box to protect the kraft box. • When will this ship? Shipping delivery times are noted in the "Shipping / Policies" section. Please read carefully. • Shipping costs are calculated at checkout. •Upgraded shipping is available at checkout. Please note...upgraded shipping will not rush your order but will ship it quicker once it is ready to ship. *If you need a rush order please contact me before purchasing to make sure I can accommodate your request. 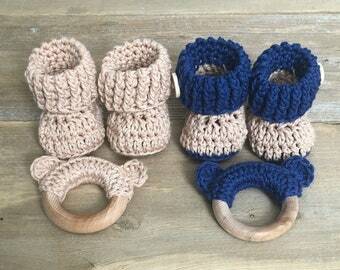 Please visit my shop for additional colors and styles. Free First Class Shipping to USA only. All items in order must ship to address on invoice. Please check the shipping/policies at the top of each listing. Turnaround times vary per item. Once an item is ready to ship you must factor in shipping times. Overseas items must process through customs and delays may happen. Most items in my shop are ready to ship. Ready to ship items will ship within 1-3 business days. Your message may be anything you would like to say and in your language of choice. Please leave your message in the note to seller section of the invoice. If message is not in English please have your message already translated. I will send you a pdf for your approval. If you do not reply to the convo with your pdf then your pdf will be considered approved. If no message is left in the note to seller section of the invoice, and you do not respond to conversations that I have sent, then the default message will be the same as the first photo in the listing you selected. BOXES HAVE NO INDICATION OF WHAT'S INSIDE. 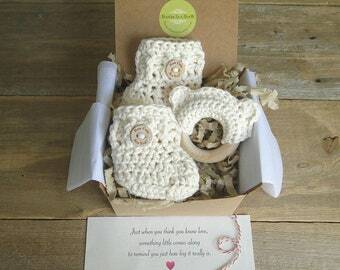 Each little box for Booties in a Box® comes with a care tag on the outside. There is no mention of what the box contains. Each little box is a complete surprise until opened. 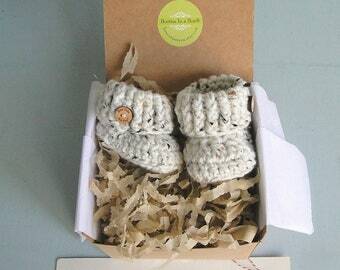 On the inside of each box is my registered trademarked product name ~ Booties in a Box®. Every listing in my shop has photos of the box and label placement inside the box. 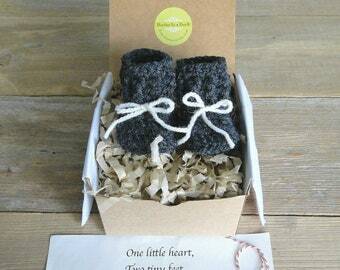 Box for booties is a small kraft box - large enough for newborn booties and a message. The shipping box has no indication or mention of booties. The shipping box has my shop name How Cute Are You?,LLC along with my address. Customer's name is not part of the return address. Before submitting a rush order please be sure to contact me first. I will then let you know if I am able to accommodate your request. Your package will ship first class unless you purchase upgraded shipping at checkout. First class shipping is generally 3-5 business days anywhere in the continental USA. USPS Priority is 2-3 business days. This is not a guaranteed service by USPS or my shop. USPS Priority Express 1-2 business days. This is a guaranteed service by USPS and my shop. If item is not delivered on schedule you will receive a refund for the upgraded portion of your shipping. If you package is marked delivered by USPS or any other postal service and is not received then you will need to contact your local post office to resolve the situation. My shop is not responsible for packages that might be missing but are marked delivered. If you live in an apartment or there is no secure location to leave your package, please request "signature required" at checkout. I am not responsible for packages that might have been stolen once they are delivered. Once I hand over you package to USPS or any other postal service then it is in the hands of the post service to deliver the package in a timely manner. I will do my best to help you with a situation regarding your package. Your order will ship to the address on the invoice. If you need to ship to another address then please make sure you change the ship to address before completing your order. You will need to make separate purchases for each address that you are shipping to. I ship to only the address on the invoice. Shipping charges only cover packages to the address on the invoice. The cost of shipping includes shipping materials plus postage. If you make different purchases and they are all shipping to the same address I will combine shipping and refund the difference once your package has shipped. I strive to make beautiful, quality items but if for some reason you are not happy with your purchase please contact me so I can resolve any issues with you. Cancellations and refunds are not given for digital downloads. You will receive a PDF immediately upon receipt of your payment.